The embroideries charted here reflect my interest in counted thread embroidery of the medieval period, as opposed to free embroidery or blackwork. I especially lean towards early stuff, particulary the bold colors and geometric patterns of German and Scandinavian embroidery. With the advent of the Web, I can now make these charts available to all, rather than have them mouldering in folders in my attic. Icelandic Altar Hanging, late medieval. 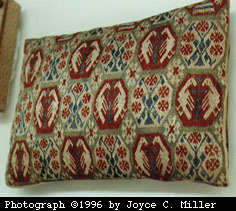 Embroidered Cushion. 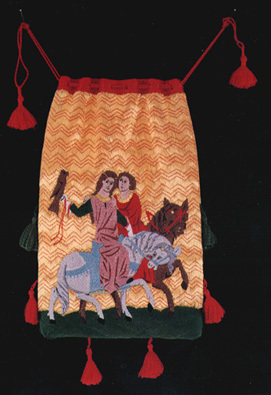 Westphalian (German), 14th-15th c, brick stitch. Embroidered Box. 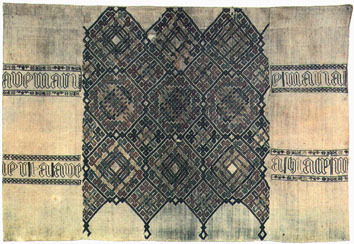 Westphalian (German), 14th-15th c, brick stitch and long-armed cross stitch. And more as I find them.